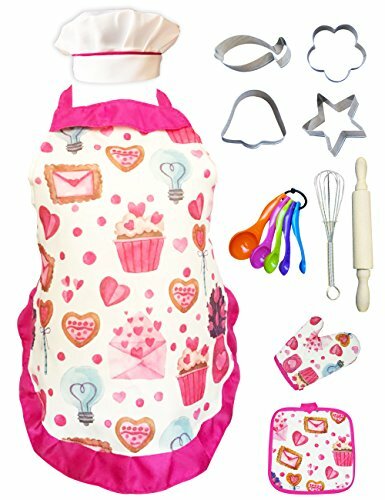 Cupcake Chef Set for Kids Cooking, Play Set with Apron for Girls,Chef Hat, and Other Accessories for Toddler,Career Role Play, Great Gift for Children Pretend Play, Size Medium 5-12 11 Pcs (Chef set) by NLooking at Baking Love. MPN: unknown. Hurry! Limited time offer. Offer valid only while supplies last. THE CHEF SET FOR KIDS INCLUDES: chef's hat, cupcake apron for girls, oven mitt, hot pad, 5 measuring spoon,rolling pin, hand mixer and 4 radom cookie cutters. Fit for chef's all cooking and baking needs. THE MATERIAL OF PLAY SET: The apron for girls is pink cupcake white background, with ruffle trim. The chef's hat is elastic, and the apron has adjustable Rope . The rolling pin are made of wood. There are 4 different radom shapes cookie cutters, make the children pretend play games much more fun. TEACH THROUGH LIVELY ACTIVITIES: Kids can play career role play while helping mom and dad in the kitchen. Let children experience and find interest in cooking and making food, to learn cherishing food and respecting for labor. The chef set is a good choice to teach through lively activities. SPECIFIC FUNCTION OF THE CHEF SET: Kids love pretend play games, this chef kit is definitely worth buying. Maybe you have bought a lot of play food toys or kitchen playsets for kids, this role play set will make your children to a real little chef. Kids will enjoy cooking role play with friends. RECOMMEND AS PRESENT: Play Set with Apron for Girls is well packed so you can give as present. All accessories of the chef set are washable and safety tested. Encourage creativity educational.Role Play toys can teach kids about cooking during fun pretend play games. Recommend as birthday present and holiday gift. If you have any questions about this product by NLooking, contact us by completing and submitting the form below. If you are looking for a specif part number, please include it with your message.